You can also migrate (to use a geekish term) your collection of names, addresses, and email addresses from your desktop or laptop PC or Mac to the Tab 4 NOOK. The trick is this: Export your contacts list from the computer in a compatible format that can be imported into the Tab 4 NOOK. Not just any format will work. Open your email or contacts program on your computer and look for a command to export records. It may be under the File menu item. 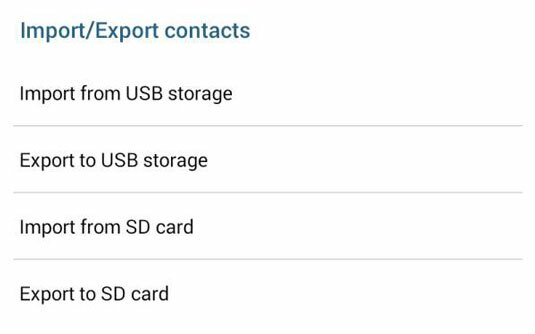 If you can, go ahead and export your contacts as vCards to a location on your computer. If you’re lucky, you will find an option to export the files as vCard files, or in the VCF file format. This option is available on the Mac and on certain mail programs on Windows machines including Windows Mail and Windows Live Mail. It is not available in the widely used Outlook program on Windows machines. Connect the Samsung Galaxy Tab 4 NOOK to the computer using the USB cable. Transfer contacts to the tablet. You can put the file anywhere; when you’re done, you can delete the VCF file from your tablet because it’ll have converted them to an Android style. With the files on the Galaxy Tab, open the Contacts app on your tablet. In the Save Contact To option, tap Phone. Yes, you know the Tab 4 NOOK is a tablet, not a phone, but the Android operating system was developed for smartphones first and is not always consistent in its menu options. You may end up with some duplicate Contacts entries. You can handle that later by joining multiple contacts.